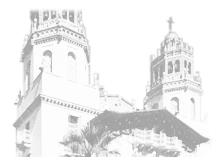 See the complete history behind Hearst Castle on a five-story screen. * For later show times, please contact the Theater at (805) 927-6811. The Hearst Castle Theater at the Hearst Castle Visitor Center is a five-story screen theater showing the resident film “Hearst Castle – Building the Dream.” This is the companion film to daytime Castle Tours and is included in the ticket price. “Hearst Castle – Building the Dream” is a movie that was produced exclusively for the Hearst Castle Theater. Breathtaking original cinematography combined with vintage clips and stills from the 1920s and 30s allows the construction and history of the Castle to come to life on a five-story screen. This original 40-minute movie is screened every 45 minutes starting at 8:15 am. The last show of the day is usually at 5:15 pm, but movies may be scheduled later to support the seasonal changes of the scheduled daytime tours. Please contact the Theater at (805) 927-6811 for the later show times. For visitors not going on tour, tickets for the film may be purchased separately for the price of $10 per adult and $8 per child (ages 5-12.) Discounts are available for groups of 12 or more people. At various times of the year, the Theater may also host additional educational and entertainment special events. Check with the Theater or monitor local news media for information about these events. The lobby of Hearst Castle Theater is home to an impressive display of 17th century tapestries from the Hearst collection. Plan on some extra time to enjoy these artifacts at your leisure during your visit at the Visitor Center.